My IC-706 starts transmitting automatically when the CQRLOG Db is opened. If I shut down CQRLOG the transmitter continues transmitting. If I remove the rig control USB cable from the computer and reinstall, the radio stops transmitting. I running the latest Ubunto build: 18.0xx. "Run rigctld when program starts" selected. As a long time owner of ic706 I can say that it should not do that. How is your ptt line connected? Check preferences/trxcontrol handshake,dtr and rts to be as "unset". With correct device and handshake line name. PTT can be activated from same dev or from a different serial dev. Problems, if still exist, can be avoided by starting rigctld at system startup or user login. I am using user saku's crontab to run starting script with * * * * * (run every minute) timing. After starting that way cqrlog/preferences/trxconrol "run rigctld at program start" must be unchecked and rig type2 Net hamlib rigctld. See the web link in my previous message on this thread. Now I finally had some time to do some testing with the Icom IC-7610. Your suggestion to put 'Unset' instead of 'OFF', lead only to the radio turned into transmit from start and stayed there. I think the Unset is a feature from the days of old tristate ports at the computer. I am not so sure about an USB gismo like to be in a tristate condition. I think it like to be ON or OFF, not something in between. My common sence tells me that the results are not very predictable, when you have something floating with high impedance close to a transmitter. Mousepads are a good example. I think that the short transmit at startup is something we have to live with. 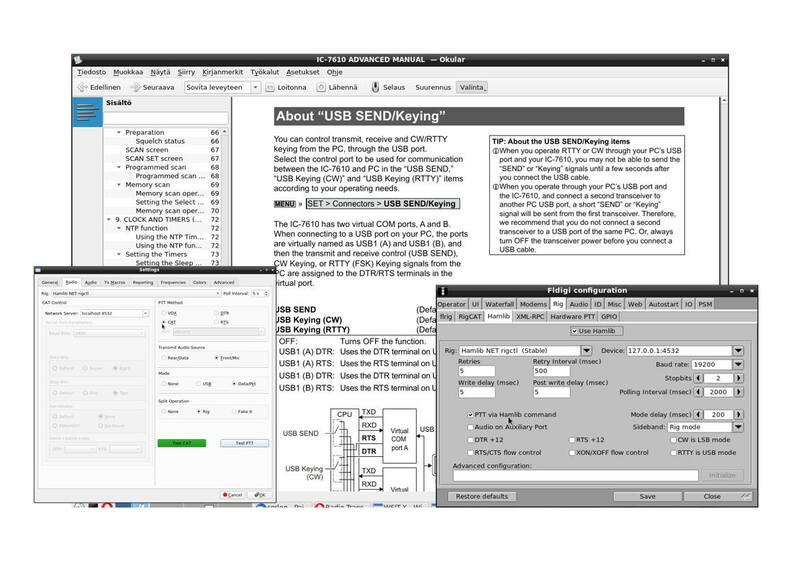 Do you really need "USB send keying"? It can be turned off. Then there should not be any transmit at startup. With IC7300 there is selction "Inhibit timer at USB connection" but I can not see it in IC7610. So the only way is to turn it OFF. Wsjt-x does not need it, fldigi does not need it. Both can be set so that ptt is driven via CAT command. fldigi "Configure/rig/Hamlib/PTT via Hamlib Command"
Only cqrlog/NewQSO/File/Tune fails with that if CWkeyer "Hamlib" is selected. "Check preferences/trxcontrol handshake,dtr and rts to be as "unset". Then, if you need ptt function from handshake line use field " extra command line arguments" like: -p /dev/ttyUSB0 -P RTS"